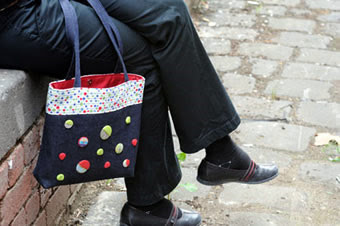 In 2003 after returning home from London, Alyssa launched the fun and sassy Lyssy May bag and accessories label. Six years, two cities, her own store and a new studio later, Alyssa is now based in Melbourne and selling her handmade creations all over Australia. The Lyssy May range includes handbags, satchels, purses, travel bags, wallets, cardholders, and adorable mini-bags for little girls-about-town. Bags are fully lined and fabric-protected and include reinforced stitching, heavy duty interfacing and hand-stitched embellishments. I fell in love with the Lyssy May peacock satchel made in collaboration with Thea & Sami at the Stitches and Craft show. And the Sushi Sister bags with chopstick handles are real head-turners. 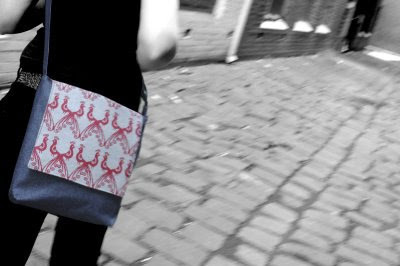 You can find Lyssy May bags in the online store and at stockists around Australia. You can also find more information about upcoming designs on the Lyssy May blog One Day At Lyssy May. Great find! Loving the use of chopsticks for handles. Hi Steph, Thanks so much for the fabulous post and for being such a wonderful supporter of Aust design! Yay! I love Lyssy May (obviously) and I carry my own peacock satchel around. She just keeps designing better and original bags. Great article! Particularly love the Peacock satchel with the Thea and Sami print. 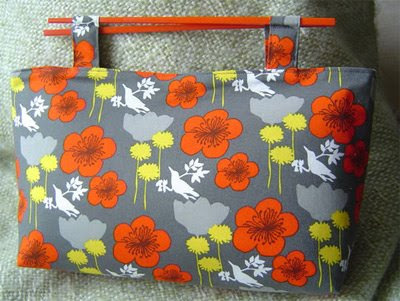 Am off to La Bella Donna in Morningside this week to check out Lyssey's new purses. Thanks Rebecca and Helen! Much appreciated. Lyssy May - of course it's my pleasure. Thea - keep on collaborating you two!